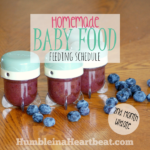 If you are just joining us, this is the 5th month update of feeding my baby homemade baby food. 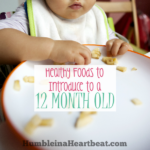 Each update I have given you the details of what foods I introduced to my baby (Bella) during the previous month. Bella is exuding so much personality now. She has really gotten into her feedings lately, and she’s not afraid to show her anger (when the food is “all done”) and excitement (she tends to frantically move her hands and feet before the food enters her mouth). 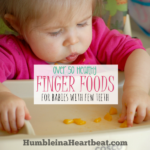 I gave Bella a ton of finger foods during her 5th month of solids. She was a natural, picking up each piece of food like she’d done it a thousand times before. Towards the end of the month, she discovered gravity. 🙂 I gave her some diced potato, carrots, and peas to eat, and after she had eaten a few pieces, she began to grab a piece at a time and throw it over the edge of her tray. She noticed that I was looking at her, and she smiled at me as she did it. I think we’re in for some fun dinners ahead! Right before Thanksgiving, I noticed that I was running low on pretty much every puree that was left in the freezer. 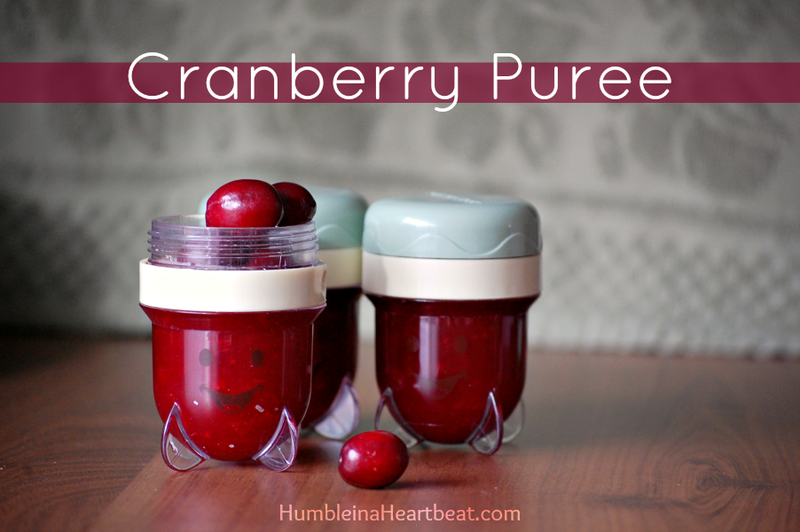 When I went to get my Thanksgiving groceries, I gathered some food to make purees and finger foods for Bella, too. It was nice to be prepared from Broccoli all the way down to Black beans! I spent a little time preparing some purees for the freezer, and a couple days later, I got the finger foods ready. Currently, Bella is eating pretty much 3 meals and one snack every day, in addition to the few nursing sessions she has left before I wean her. It takes a lot of planning and preparation to pull off, but I can’t wait to share with you how you can do it with less stress! For each new food Bella tried this month, I’m going to report the following (as concisely as possible): 1) how much time I spent preparing it (keep in mind this is active time and doesn’t include cooking time), 2) the quantity it produced, 3) the recipe or how I prepared it, 4) the cost to make it (for each of the first three days of introduction I gave her 2 ounces), and 5) Bella’s reaction (both how she liked/disliked it and if there was an allergic reaction). Recipe or preparation: I used the directions to cook barley from Homemade Baby Food Recipes. Right after I made the barley, I realized that the directions in Cooking for Baby (a great book that I highly recommend) were probably better because it mentions that you should pulverize the barley before cooking it. I didn’t, so I had to use the immersion blender once it was cooked, and it was a lot like the oatmeal – really goopy. I had to mix it with other purees to thin it out and so she could actually eat it. Reaction: She wasn’t going for just plain ol’ barley. I had to mix in another puree for her to eat it. I wouldn’t eat it plain, either! For some reason she would start gagging on the barley (even when it was mixed with another puree) towards the end of the feeding. I think it had something to do with the cough she had, though. The first day I mixed it with pear sauce and she loved it. Recipe or preparation: I peeled the tomatoes, cut them in half, and placed them on a baking sheet lined with foil. Then I put them in a 375 degree F oven for 10 minutes. I took them out and let them cool, and then chopped them until they were small enough pieces for her to eat. Reaction: She liked tomatoes from the get-go! 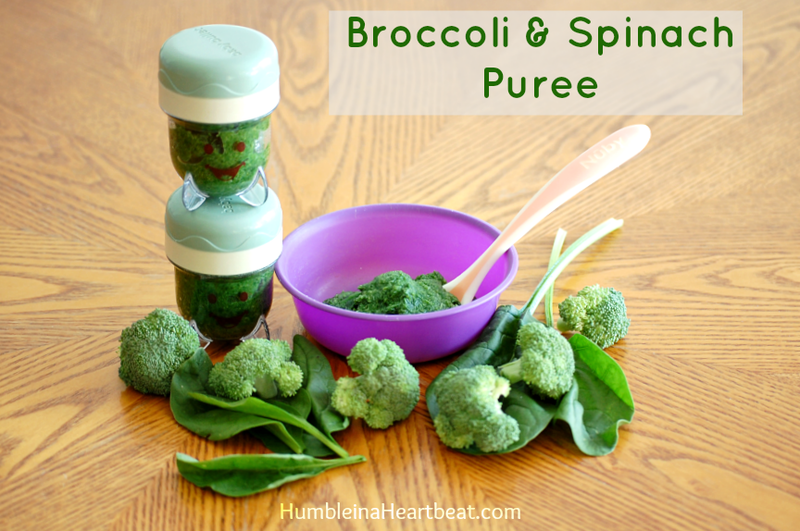 Recipe or preparation: I made Spinach and Broccoli Puree from Weelicious. Normally, I like to introduce the new food on its own at first, but I think that broccoli can be powerful for a baby’s small digestive system. Making the broccoli with spinach allowed me to give her less broccoli while still giving her the same amount of food. Reaction: She didn’t care for it, but once I mixed some yogurt with it, she couldn’t get enough! Recipe or preparation: I just used leftover turkey from Thanksgiving and either cut it into tiny, bite sized pieces or blended it until the pieces were really tiny and added it to other purees. Cost: Since this was leftover turkey, and the turkey was paid for by my brother-in-law, I’ll have to guess at the cost. I’ll guess about 10 cents per ounce. Reaction: She was loving turkey, especially the fact that she could use her fingers to grab the tiny pieces! 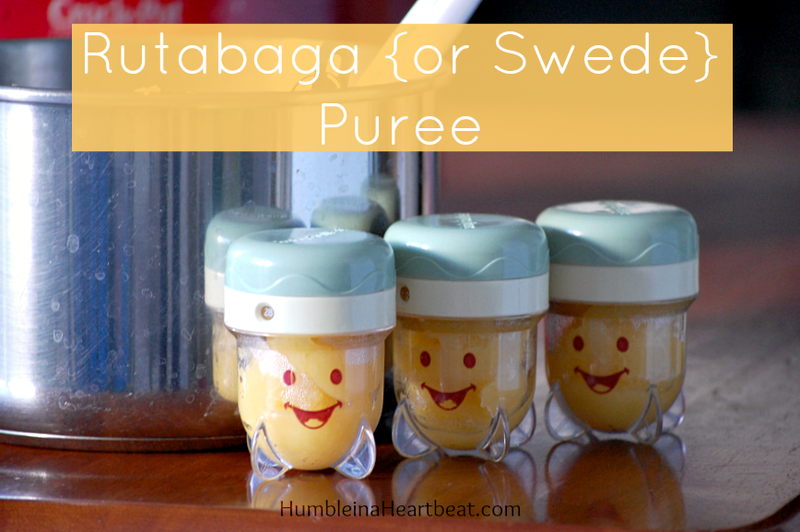 Recipe or preparation: I used the recipe from Wholesome Baby Food by Momtastic. Make sure to put the sauce through a strainer after pureeing to separate the skins out. I didn’t do that step, so I had to remove the skins with the spoon and it was annoying! Reaction: I thought she would make a sour face. Instead, she seemed to thoroughly enjoy the cranberries from the first bite! 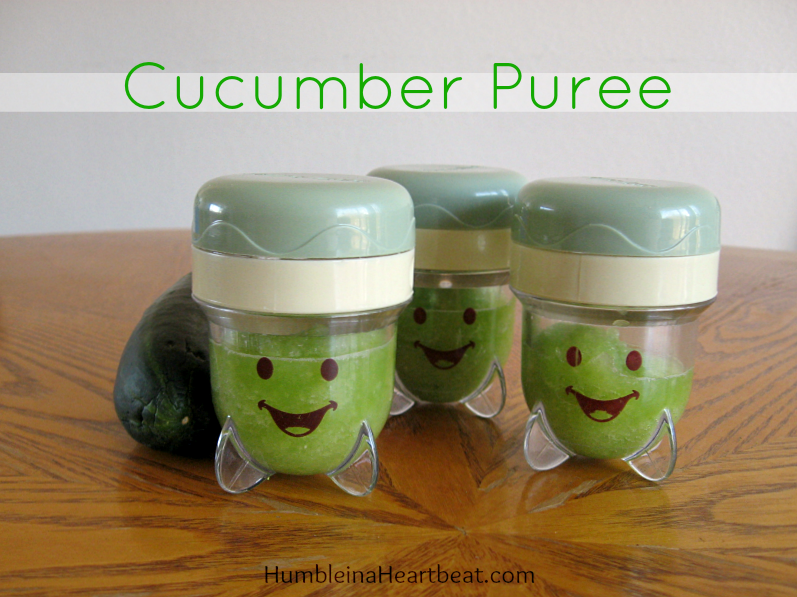 Recipe or preparation: I used the directions found on Wholesome Baby Food as a guide. I peeled the cucumber, seeded it, and chopped it into tiny pieces. Then I pureed it with the immersion blender. No cooking required! It’s a very runny puree, so no extra water or breastmilk is really needed. Reaction: She ate it up without a problem. Recipe or preparation: I mashed the cooked beans with a fork. If you need directions how to cook dry beans, click HERE. I took one bag of previously cooked beans out of the freezer to use. Cost: About 2.5 cents per ounce. Recipe or preparation: I diced the onion and put it in a hot skillet that had some olive oil. I sauteed the onion for about 7 minutes, and then I took it out of the skillet and minced it so she could digest them better. Reaction: She seemed to really love the onions mixed with sweet potatoes, carrots, and apples. She had really bad breath for the 3 days I was introducing this to her, just FYI. 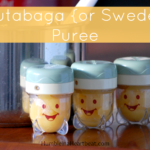 Recipe or preparation: Rutabagas are also known as Swedes in Europe and other parts of the world. To cook them, I just prepared them as if I was going to make mashed potatoes. 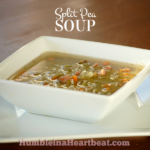 I peeled them, cut them into 1-inch chunks, threw them in a pot of cold water, and brought it to a boil. Once boiling, they boiled for about 15 minutes and then I checked with a fork to see if they were fork-tender. Then I drained the water and pureed them. You could also just dice them into small pieces for finger food. Reaction: She seemed to like it at first, but then she refused to eat it anymore after 5 or 6 bites. Yogurt must be the miracle food, because a little yogurt mixed with the rutabaga and she was all over it! Time Total: Over the course of a month, I spent a total of 2 hours and 45 minutes (approximately) making Bella’s baby food. That includes all the new foods I introduced as well as any purees and finger foods I made throughout the month. That’s just 5 minutes each day if you spread it across the month. Super small time investment if you ask me! 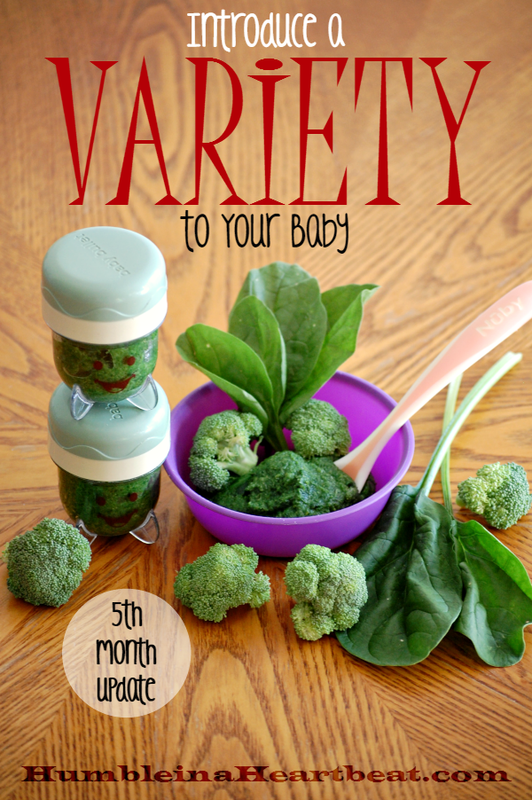 This coming month will be the final month of Bella’s baby solids feeding schedules. After that, I will be doing a toddler series. I want to continue introducing new foods to her and giving her previously introduced foods on a regular basis. 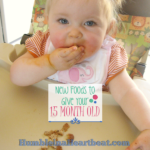 By the time she turns one, Bella will have tried 50+ foods! I made my own baby food too and I swear that’s part of the reason why my kids aren’t fussy when it comes to vegetables. They tried every thing by the time they were 1 1/2! This is fabulous, well thought out post Charlee! Even though my children are out of this stage, I pinned this because other parents could benefit from these ideas, tips, and recipes. Wishing you well and Merry Christmas! I completely agree, Jennifer. I am not seeing either of my girls being really picky yet. I really appreciate you pinning! Merry Christmas to you, too!